Hello, I am the President and CEO of the Organization by name and style of RRHEDS(Redemption Research for Health and Educational Development Society) doing charity services to Poor and Needy Irrespective of Caste and Creed in the Fields of Health, Education, Rural Development, Disaster Management, Water and Sanitation, etc. Drinking water problems in remote area government schools, Andhra Pradesh, India. One of the most serious problems in India is access to clean drinking water and sanitation. 2.6 billion People still do not have access to a safe Drinking Water facilities. As it’s Our Fundamental Right To Have Safe Drinking Water and Sanitation Facilities in Rural, Remote and Slum area Government Schools in Andhra Pradesh, India. What Is Happening *1000 Children are dying every day in India *Leading cause of Malnutrition in Children under Five Years Old What Can Be Done *Improve Hygiene Through Hand washing *Improve Sources of Drinking Water and Sanitation Facilities What You Can Do *Spread The Message Among Deprived Section *Share This With You Network *Support RRHEDS In Its Efforts To Provide Awareness in Schools in Slums, Remote and Rural Areas of Andhra Pradesh, India. Nearly 2.5 million children under 5 years old die every year because of water related diseases. Out of these nearly 0.78 million children die of diarrhea alone.Water is scarce in most parts of India, and piped supply of water is not available in most of rural India. Women have to travel long distances to carry home a pot full of water. Most of the people in rural areas drink water directly from polluted ponds. Most of the Remote and Rural Area Schools also don't have water facility for safe drinking purpose. Every children face a big problem at the time of meals in Government Schools. One of the simple ways of solving water scarcity problem is installation of RO System attached Bore wells. 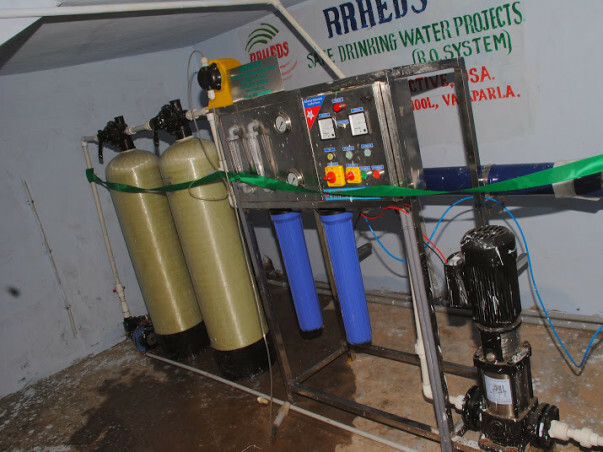 RRHEDS has taken this challenge and Planned to install several Bore wells with RO System in especially Government Schools in the state of Andhra Pradesh. Presently we are concentrating in Guntur, Prakasam and Hudhud Cyclone Effected Districts, Government Schools located in Rural, Remote and Slum areas. A source of water can change entire lifestyle of a particular area, and since it is a dire necessity, it is considered as a big opportunity for the School Children. With a small budget one could bring cheers in the faces of children who were suffering for want of one of the basic requisites of survival as well as safe drinking purpose. Thousands of School Children have to be benefited with the Bore wells with RO System installed by RRHEDS with the support of Donors. It is one of the greatest gifts one could donate to a community. A bore well not only brings access to water, but most importantly Installation of RO System access to clean drinking water and removes the Contamination in the water and reduce the Flouride contents also. Then the school childrens are safe from water born Diseases and we get to reach an entire community and share the love of our savior. We have already survived the Government Schools and they are facing a lot for access of Drinking Water. For coming months it is very big challenge especially for School Children at the time of Summer Season.